Ready for her close-up aboard an ice cream inspired steed is Penelope Margaret Ganner at the Museum of Ice Cream. The San Francisco attraction is not a museum really, but an entertainment venue promising a couple hours of tasty fun. and her niece Amarylla Ganner, on old-fashioned dial-ups. Ice Cream stops. It's a pool of non-edible sprinkles for kids to play in. Below, he is joined by his parents, right, sister, auntie and friends. SAN FRANCISCO'S Museum of Ice Cream Museum brings out the kid in children of all ages. Apparently, people from all over the world shout, "We do! Make mine a double scoop." 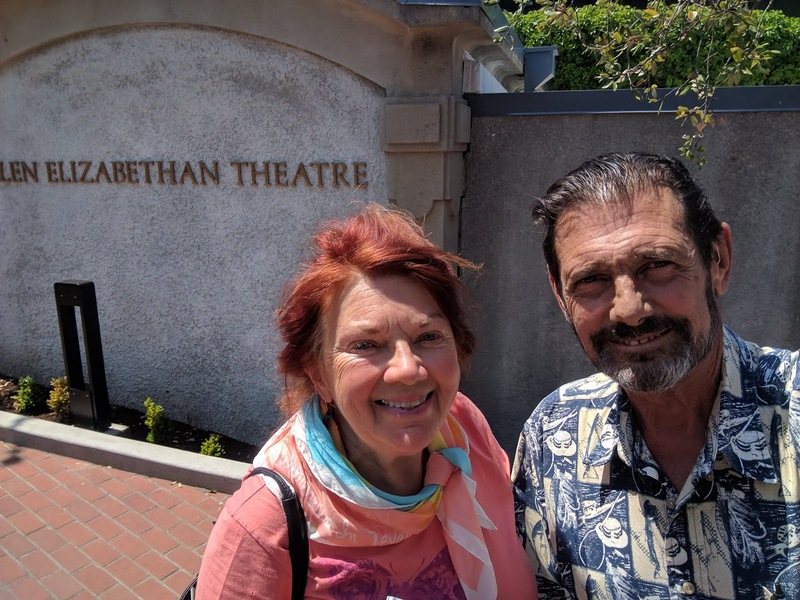 So we recently joined an international crowd to queue up for a two-hour journey into the history, mystery and fun of ice cream at the colorful San Francisco venue, right in the center of town just steps from Union Square. We based at the lovely Handlery Hotel Union Square, steps away. THERE'S A LOT of theater in the museum, which isn't really a museum at all, but rather an entertainment venue geared to family fun. From the moment you show your tickets and progress into the line, you're front and center for a bit of edible theater. First, you must have an ice cream name, so our party of six came up with some doozies: Keller was Peppermint KK. I was Cookie Monster Mocha. Our family signed in as Mint Chocolate Chip Daddy, Apricot Amarylla, Peachy Peny and Jelly Bean James. We joined an international crowd to queue up for a two-hour journey into the magic, mystery and fun of ice cream at the colorful San Francisco venue, right in the center of town just steps from Union Square. There's a lot of theater in the museum, from the moment you show your tickets and get in line for the first of of several interactive exhibits. THE MUSEUM of Ice Cream concept was born in New York City as an user-involved extravaganza with ice cream and candy themed exhibits, all brightly colored, in a maze of rooms containing a rock-candy cave, a unicorn, and the fabled swimming pool of rainbow sprinkles which made its way to the San Francisco show. The exhibits are tailored as backdrops for selfies, and social media sites promote the exhibit. Tickets are not cheap and must be purchased in advance for specific time slots online only. that puts interesting adornments on people. THE TREATS are plentiful as there are tasting stations along the way: your choice of several samples. We enjoyed peach and mint chip mochi, popsicles of several flavors, cotton candy (pink of course), delicious fruit sherbet and ice cream cones, then at the last munchy stop, hot chocolate served in an old-fashioned '50s soda shop with whipped cream topping. Capping the day are samples of hot chocolate with cream. used snow to ice the mixture -- long before refrigeration. 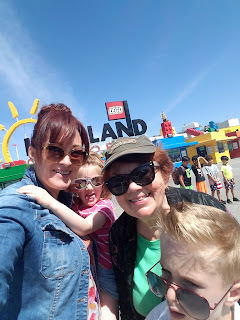 The audience is largely family-oriented -- grandparents and parents taking their kids on an outing, or great-aunties and uncles such as ourselves treating the family out for a fun afternoon. Lots of pictures were taken and everyone had a cell phone. Instagram photos aplenty were in vogue. really eventually type their way to "Hamlet"? 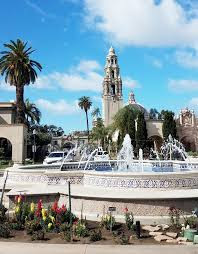 NEXT UP: Balboa Park is a beloved urban park, one of America's largest and a a tribute to the vision of its founders, who conceived of the idea more than 150 years ago. 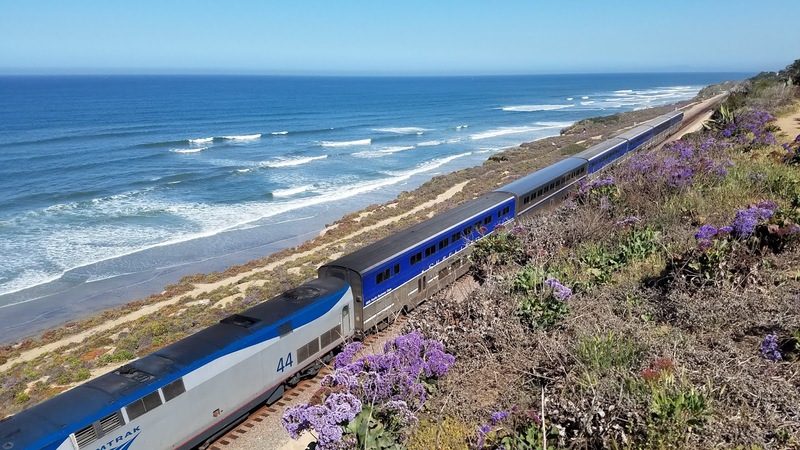 Come with us to visit this San Diego wonder, with magnificent gardens, hiking and walking paths, a theater, concert venue, buskers, food aplenty, a green belt, a veritable 17-museum mecca, and the world famous San Diego Zoo. Meanwhile, remember to explore, learn and live and catch us each Friday for a novel look at travel, nature, family, the arts and more. The Elvis Presley home in Palm Springs is a major attraction and a striking presence, with its unusual modern design. about because the studios wanted to keep stars close to L.A. THE STARS come out in Palm Springs. Or at least star-gazers do. Many of the greats who once luxuriated in the desert sun are gone to that big movie palace in the sky, but there are still some around this ever popular hide-away of the rich and famous. The stars settled here because studios insisted contracted personnel be within two hours from Hollywood -- not as far as "Sin City," Las Vegas. 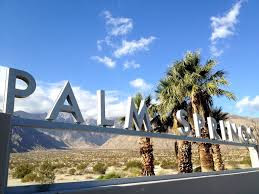 Many of Palm Springs' current residents snd visitors were barely born when Frank Sinatra, known as "the Chairman of the Board," caroused with Sammy Davis Jr. and Dean Martin. 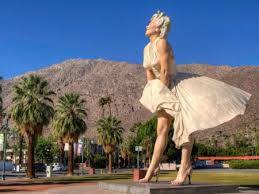 John F. Kennedy visited Palm Springs to see Marilyn Monroe, who lived in a sweet little bungalow at 1326 Rose Avenue. Loretta Young entertained here. Bob Hope golfed here. when you take a lively tour with guide Jeffrey Swanson. "The King," Elvis Presley, leased and later purchased a striking contemporary home here, honeymooning with Priscilla in 1967 after a secret wedding in Las Vegas. After ups and downs with listings -- from $9.5 million in 2014 to $5.9, to less than $1 million, the home is currently valued at a surprising $750,000. Keep in mind that July in Palm Springs can be 110 degrees! It is not a year-round comfort zone, but gorgeous on our recent spring visit. 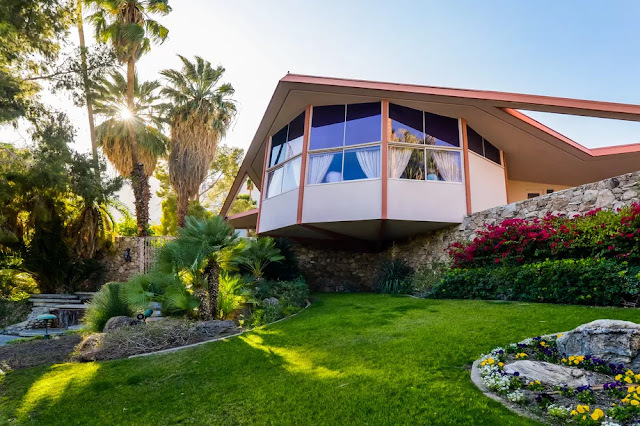 Designed by prolific modern architect William Krisel, the Elvis house was built for Robert Alexander of Alexander Construction Company, which assembled thousands of Southern California homes in the 1950s and ’60s, defining the architectural style of Palm Springs. The Double Tree by Hilton Golf Resort Palm Springs is a fine base. THE ELVIS HOME is a five-bedroom, 5,000-square feet spectacle, built in four intersecting pod-like wings. The unusual house where The King held court was named "House of Tomorrow" by Look Magazine in 1962. Pool and tennis court included, of course. knowledge and lore, a terrific tour guide. architecture, eateries and the region's history, including its Native American heritage. We ended the engaging day with a date milkshake at Windmill Market. Springs property today is Leonardo DiCaprio, who bought singer/actress Dinah Shore's former home at 432 Hermosa. It's an elegant but not over-the-top place designed by famed architect Donald Wexler with Shore's help in 1964. 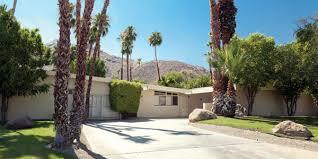 Twin Palms, Frank Sinatra's Palm Springs home. and has toured Chicago and other U.S. cities. 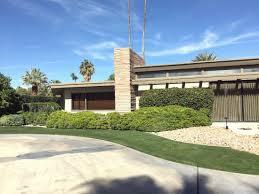 The Sinatra house, "Twin Palms," is a pretty mid-century modern house where "the Chairman" lived from 1947 to 1954. Liberace designed his two Palm Springs homes in musical motif. Swanson showed us both, along with those owned by Alan Ladd, George Montgomery and the famous Gabor sisters, Eva and Zsa Zsa. You can find the homes yourself, but we recommend the delightful Viator tour for its ease and entertainment. Swanson's love of the place shines through. against the hillside with welcoming palm trees. during an afternoon of indulgence at the Museum of Ice Cream. UP NEXT: Ice cream, we all scream! Who doesn't like ice cream, so why not venture into the Sprinkles Pool with us at the San Francisco. We took our favorite photo subjects to The Museum of Ice Cream in San Francisco. The concept began in New York City as an interactive art exhibit with ice cream and candy themed exhibits, all brightly colored, in a maze of rooms containing a rock-candy cave, a unicorn, soda fountain and a swimming pool of rainbow sprinkles. Remember to explore, learn and live and catch us each Friday. 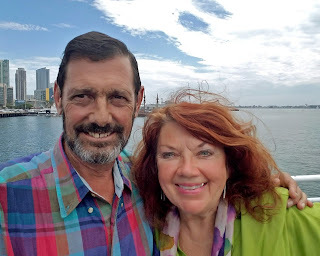 San Diego in spring is a sight to behold -- with blue skies, feathery clouds and a dinner or lunch cruise aboard Hornblower. "To what purpose, April, do you return again? Cookie and Keller welcome spring aboard Hornblower. 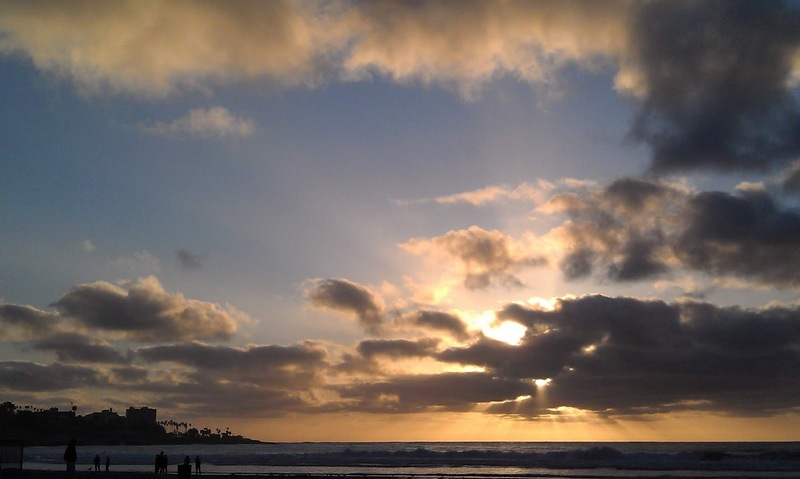 SAN DIEGO offers many pleasures from world class theater to water sport and fine dining. Its year-round beauty is a huge plus, and it's at its finest in spring. Chief among San Diego's attractions for this Rocky Mountain girl is the gorgeous climate. Dry warm weather makes San Diego a "most desired" city. The beauty peaks now when many of our annual 30 million visitors call. beauty, fine dining, viewing and fishing. 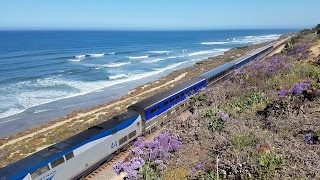 So whether whale watching with Hornblower or enjoying a dinner cruise in November, hiking among desert flowers in March, relishing summer's bloom bonanza in June, balmy ocean breezes in July or holiday cheer in December, there is no "bad time" to visit San Diego. "America's finest city" deserves its moniker. 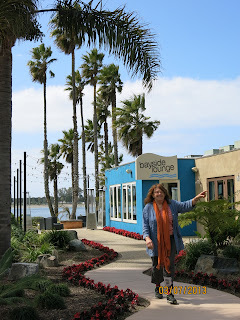 IT IS HOME to a large sport-fishing fleet, a major ball park, state-of-the-art cruise terminal, train travel and airport and many fine theaters including the world renowned La Jolla Playhouse, which sends productions to Broadway, recently its Tony winning "Come From Away." "Diana," a stunning new musical by the creators of "Memphis" is selling out. 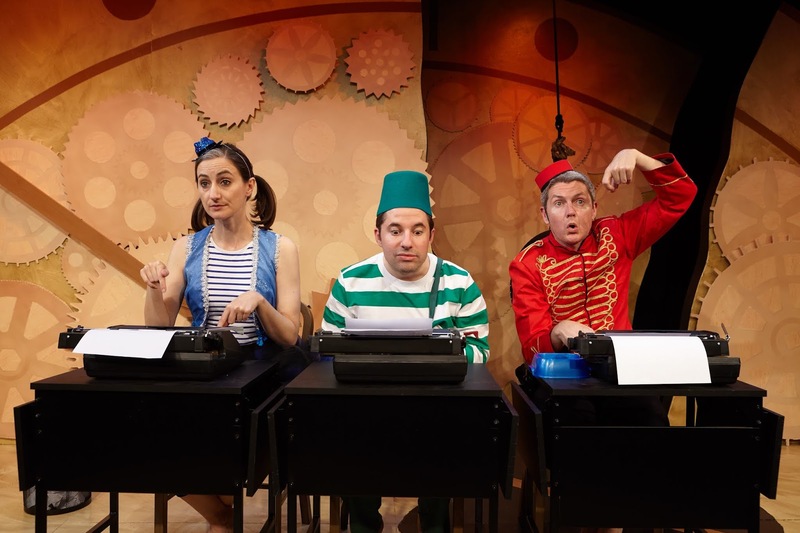 Another brilliant play, "A Jewish Joke," was developed by San Diego's inventive Roustabouts Theatre Co. and brilliant actor Phil Johnson. It opens soon off-Broadway, directed by North Coast Repertory Theatre's gifted artistic director, David Ellenstein. Camp Pendleton and its Marine Corps base bring money and people to the region and San Diego is homeport to a huge Pacific Navy fleet. 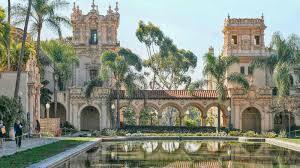 Balboa Park offers a 1,200-acre urban oasis with welcoming parks, natural vegetation zones, green belts, gardens, and walking paths. It houses a variety of world-class museums, theaters, and the famous San Diego Zoo. Panama-California Exposition and the canal opening. here two youngsters from the Bay Area at play. ALTHOUGH we're only 1.3 million, San Diego boasts an abundance of lively neighborhoods and attractions: Gaslamp Quarter, La Jolla, Little Italy, Pacific Beach, Liberty Station and the impressive fleet of the Maritime Museum with impressive historic vessels, a submarine and the enormous USS Midway Museum. 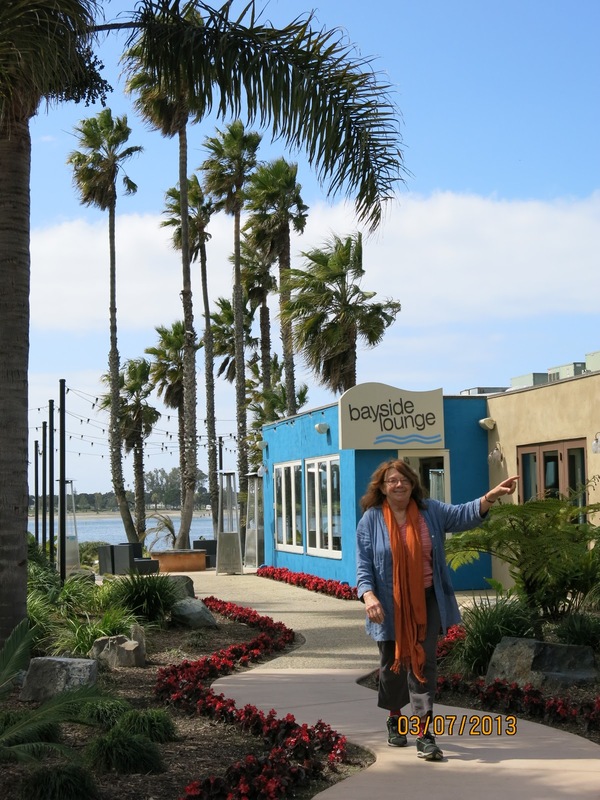 Find ethnic restaurants, fine dining, street food, craft beers, buskers and distinct flavors -- from Carlsbad and Del Mar to the north to Point Loma, North Park and Old Town farther south. ORIGINALLY named San Miguel, San Diego was discovered in 1542 by European explorer Juan Rodriguez Cabrillo, who has a lovely lighthouse named after him.The gorgeous bay and San Diego were given that name in 1602. European settlement in San Diego County began in 1769 with Mission San Diego de Alcala. From 1821 to 1848, we belonged to Mexico until in 1850, after the U.S.-Mexican War when we became a state. The connection endures, through San Diego's immediacy to Mexico. Amarylla, left, and kids Peny and James. and take the train north to Seattle. colorful neighborhoods, and nightlife. Sports teams, even with the Padres gone north, are part of life here as is world famous Legoland, a huge family theme park. Add to that attractive mix research, manufacturing, biotechnology (Qualcomm and more) and world class medical centers -- including Scripps Green Hospital, where Keller received his liver transplant nearly two years ago. Palm Springs offers a beautiful, relaxing or invigorating get-away. UP NEXT: Palm Springs has long been a haunt of the rich and famous. Come with us to see where Frank Sinatra and Liberace, Sammy Davis Jr., Loretta Young and many others escaped the pressures of Hollywood. 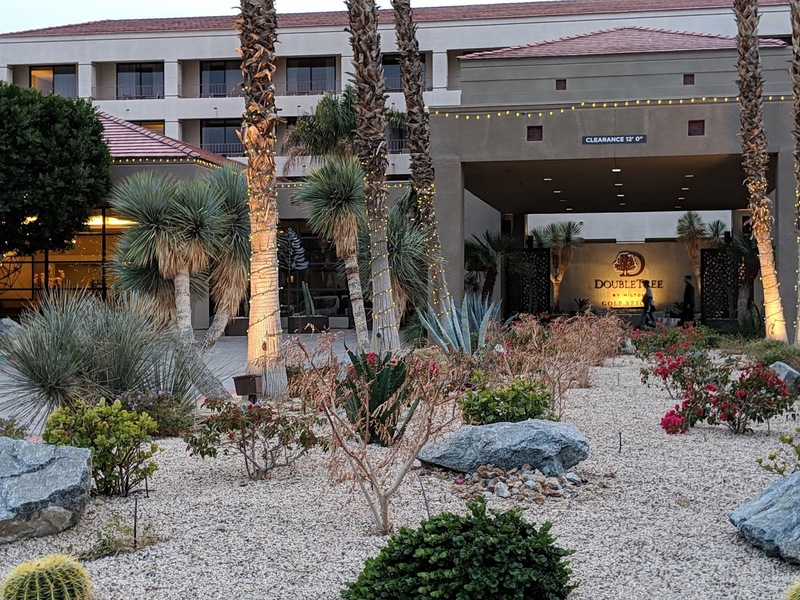 Come with us to visit this picturesque city in the Sonoran Desert of southern California, known for its hot springs, stylish hotels, golf courses and spas. We'll visit the famous Tram and stars' homes with abundant examples of midcentury-modern architecture. Meanwhile, explore, learn and live and catch us Fridays for a fresh look at travel, the arts, family, health and nature. 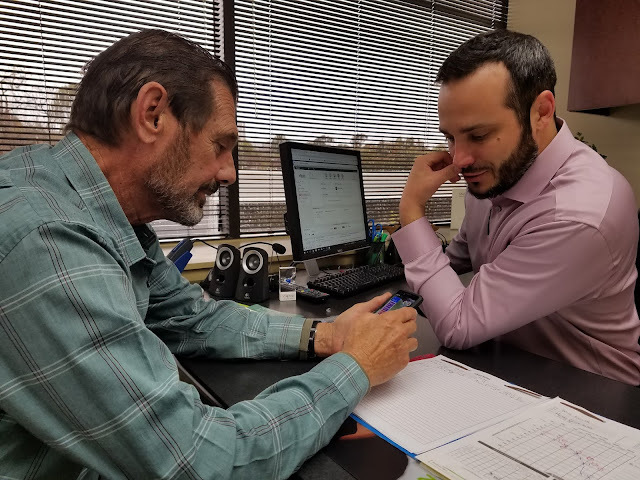 AccuQuest hearing specialist Nathan Bruce-Black walks Bruce Keller through the steps in adjusting and monitoring his hearing aids. Keller loves the optional mobile app which he calls "exciting." It allows adjustment for all environments. and banter with the waiter, an impossibility before AccuQuest. MOST OF US take hearing for granted. Bruce Keller never has, probably because he's been hard of hearing since childhood. 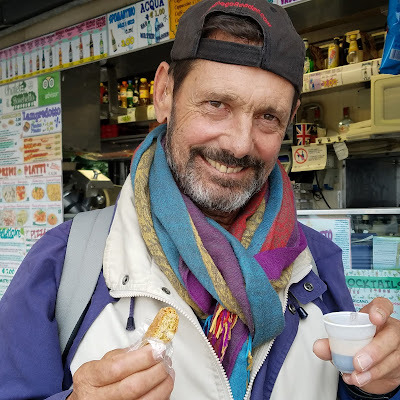 Like many hard-of-hearing people, he made concessions and got by -- leading an active professional and family life, building a successful career, traveling the world. 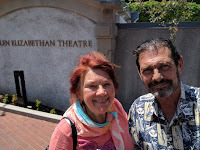 When we became a couple more than a dozen years ago, he began sitting through 110 plays and concerts a year with me. He decided his hearing needed improvement. happily to a soft-spoken anthropologist on a private tour. WE DECIDED on AccuQuest after months of research -- reviewing websites, weighing pros and cons, checking with friends and relatives who had dealt with hearing issues. Just as we suspected, he has hearing loss in both ears. The correction to his left ear was greater, who knows why. Each individual is different. The result: he is thrilled. 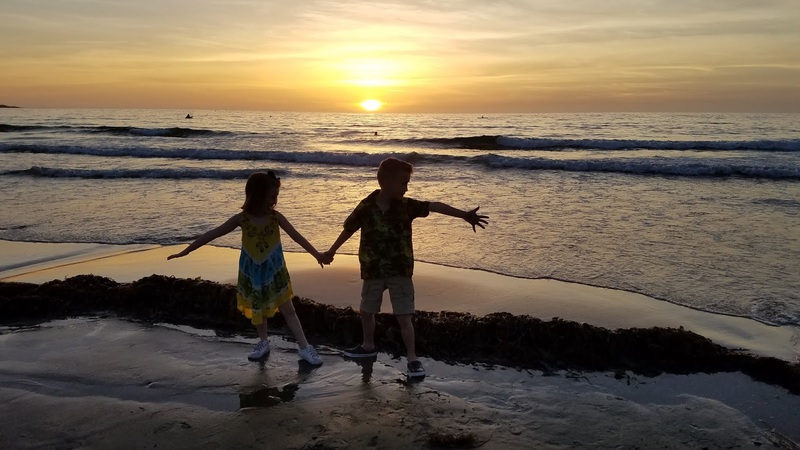 "I remember having difficulty in grade-school," Keller told the AccuQuest specialist who ran him through the gauntlet of tests. congenial person, keeping with AccuQuest's reputation. His hearing problem could stem from childhood -- hard to tell. 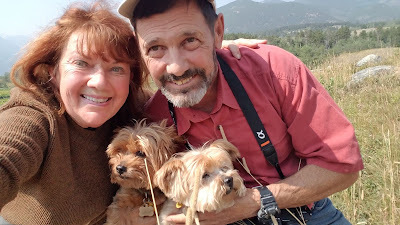 WE ARE delighted with the improvement and offer unsolicited testimony because we're at the age where we notice our problems -- and those of others. When it comes to hearing, Keller's problem is not unique. Several friends wear aids; others should. 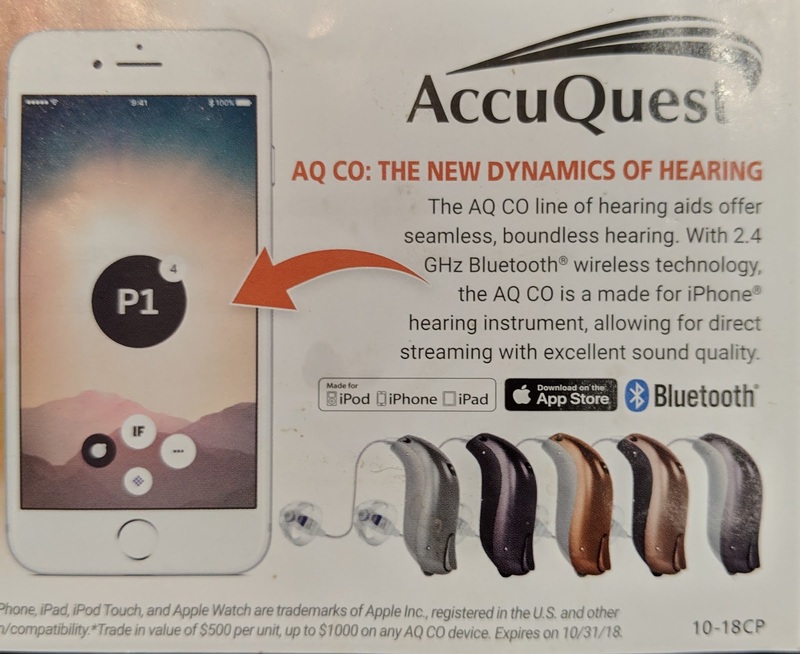 Says AccuQuest's Nathan Bruce-Black, "We work with all ages, including many who have lived with hearing loss for a long time. Having good hearing opens up a whole world, enhances understanding for patients from 18 to 90." Shakespeare Festival, "Cookie and Keller"
see up to a dozen plays. Our play-going and travel demand our senses be sharp. It's wonderful now to sit through a drama, knowing that Keller is getting the dialogue. With a concert or musical, he could ride on the songs' coattails. Not so with "Julius Caesar," "King Lear" or "Macbeth." Shakespearean tragedy and contemporary drama with quick dialogue demand concentration. Concentration relies on good hearing. "It's wonderful to understand the words and not just hear noise," Keller says. When we're at the Ahmanson in Los Angeles, in row M orchestra center, he no longer needs to rent the audio booster. "My hearing has gone from a scratchy vinyl record to a smooth sounding CD," he says with delight. UNLIKE OTHER clinics, AccuQuest offers an impressive range of hearing devices from many manufacturers. 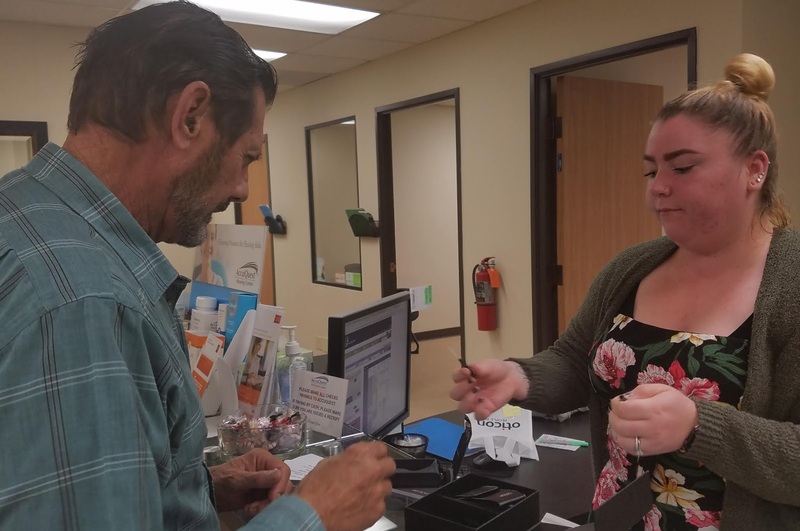 The huge selection helps patients find the best fit for lifestyle, improved hearing and budget. We've never felt high pressure and we've dealt with a half-dozen employes, recently the amiable dispenser, Bruce-Black, at the La Jolla branch, and his able assistant, Sierra. Hearing aid technology even includes artificial intelligence which helps learn and clarify important familiar voices for patient and family. Keller is on his third pair of hearing aids -- upgraded -- and this latest pair is state of the art. Technology is constantly evolving and these classy new aids have a mobile app which he adjusts to more frequencies, diminishing background noise, allowing him to concentrate on conversation. He's one happy guy. the way for state-of-the art small hearing aids. BRUCE-BLACK is patient, knowledgeable and encouraging. We initially spent around $6,000 then another several thousand for upgrades. A generous warranty, free "tweaking," trial periods, consultations and cleaning are included. And because AccuQuest works with so many manufacturers, there's a price range for everyone in the growing company's 16 states. Our life is enhanced. Casual conversation is easier at dinner parties, on cruise ships, in small foreign restaurants with several languages around us. and the sound of a nearby creek and able to enjoy casual conversation. Sailing, traveling, asking directions and hearing the answers, understanding announcements from the cockpit, even hearing a waiter or flight attendant ask what he'd like for dinner, consulting with colleagues, understanding phone callers.... All are improved. He hears the sound of a creek on a mountain hike and savors the singing of birds. And theater -- ah, the AccuQuest aids are a savior for Shakespeare. GOOD HELP for the hard-of-hearing is recent. 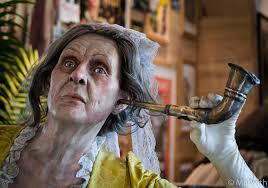 The 17th Century introduced the ear trumpet, which "funneled" sound through a narrow tube into the ear. Today, Keller's hearing aids are barely visible. to enjoy one of the country's most ideal mid-sized cities. Find out why. UP NEXT: It's an extraordinary time to welcome spring in San Diego. Rain has brought green and purple hillsides and the cruise terminal is seeing ships off to Mexico, the Pacific and Panama Canal. What makes San Diego so special? (Perhaps the average temperature of 70.) Art, music, scenery and temperature provide a quality of life unequaled in most of the rest of the world. Remember to explore, learn and live and catch us weekends for a fresh take on the arts, travel, nature and family. This alligator gave our tour boat the eye on a recent trip into the beautiful Everglades of Florida. The swampy marshes of the Everglades hide and protect alligators and more. THE UNUSUAL merging of salt and freshwater makes Florida's Everglades the only location in America where both alligators and crocodiles live together! You can see the wonder yourself by taking an airboat trip in the Everglades. We did this recently, taking to the waters in search of gators. to get up close and personal with friendly gators and snakes. We saw several in the wild, and an entertaining alligator demonstration as "dessert." You can jet out into one of the world's most gorgeous attractions and get close-up later with more gators. We did just that at Everglades Holiday Park, outside of Fort Lauderdale. A great day! Everyone has heard of the Everglades, a unique treasure of South Florida. But not all people venture into the largest remaining subtropical wilderness in the United States. We took a day to sample a small part of the park's 1.5 million acres of saw grass marshes, mangrove forests, and hardwood hammocks and wetlands. naturalists offer a fun gator show. THE EVERGLADES is home to endangered, rare, and exotic wildlife. Fellow travel writers recommended the Everglades boat ride and we were not disappointed. Our amiable captain promised he'd find alligators in the swamps. He revved up the boat and we held on to our hats as we sped around the wetlands to several spots with terrific viewing. As we zipped across the "River of Grass" between viewing sites, we bounced in our fast boat to the thunderous sound of the motor. Those little journeys were brief and we were safe and comfortable with our 30 fellow tourists from around the globe. 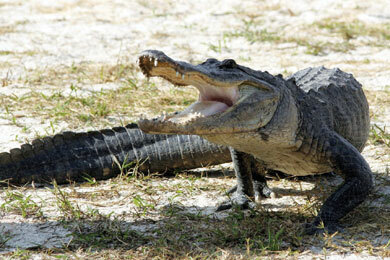 Alligators roam the Everglades; if you're lucky, you'll see one. 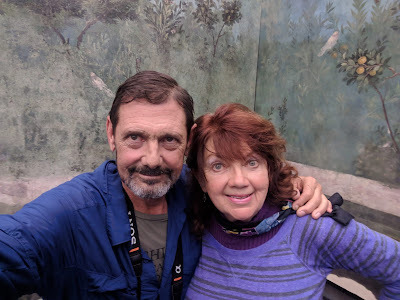 As we moved through the swamps, we noticed several small boats of fishermen -- "local folks," our guide said proudly -- bringing in the largemouth bass for which the park is famous, in fact revered. Fishermen cast off from the park's dock, or take a boat as part of a guided tour. The park offers boat and gear rentals, bait, licenses and everything else one needs to lure large mouth bass, peacock bass and catfish. Swamp land of a unique habitat offers a happy place for the alligator. The beauty of the wetlands make it a photographer's paradise. WE WERE pleased to see two school groups visiting -- fishing, taking notes, listening carefully to guides. Others were hosting guests on the boats, enjoying a celebration, spending an afternoon in a natural classroom for all ages. The park stages birthday parties and corporate events, with chartered excursions and packages. It also offers pick-up and drop-off options to take you from your hotel in Fort Lauderdale or Miami to this beautiful wildlife habitat. WE APPRECIATE that the park is a family operation dating back nearly 40 years to 1982 when George Bridges left his tobacco farm to try his hand at the park. He mortgaged his house and built his first airboat in the backyard, and the idea took off. Everglades Holiday Park serves as South Florida's premier gateway to the Everglades, one of Florida's most interesting attractions. The place is a half hour from Fort Lauderdale, on Griffin Road, and attracts tourists from Miami, too, for the marsh expedition, live alligator presentations, a small animal "zoo" with petting options, meal service, fun souvenir shop and fresh water fishing. WE HAD A magical day at the park, exploring the wonders of Florida's most enchanting natural resource: the pristine Everglades. The magnificent ecosystem is an international treasure. The greenery alone satisfied our naturalists' appetites. The gators were frosting on the cake! his hearing aids with a handy app. Keller's active life is enhanced greatly. 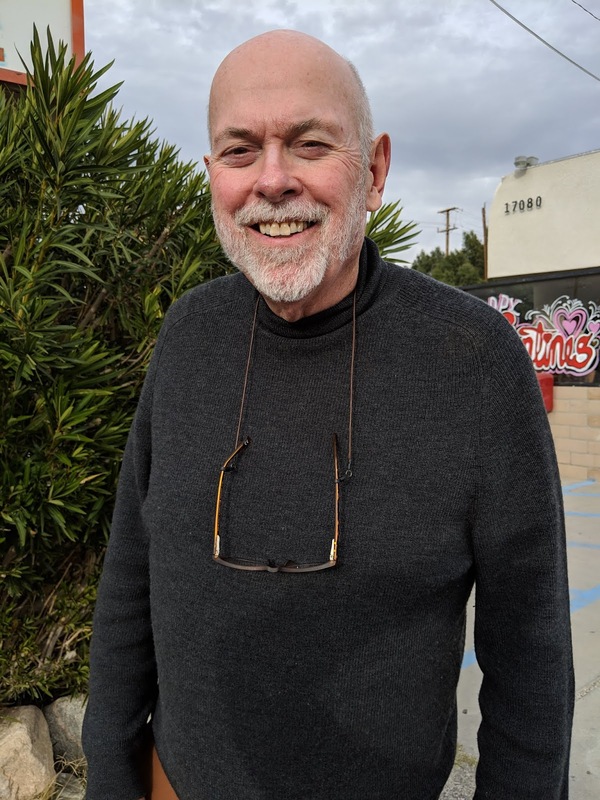 Bruce-Black is with AccuQuest in both La Jolla and Rancho Bernardo. UP NEXT: Hooray for hearing, loud and clear. After years of struggling with hearing loss, our hero takes matters into his own hands. Read about Bruce Keller's long search to improve hearing compromised by years of deep-sea diving and on-site construction racket. We explore his struggle and his decision to go with AccuQuest, after months of research. We also explore the myriad ways in which his wonderful hearing aids have improved life for both of us! Remember to explore, learn and live, and catch us weekends for a fresh take on travel, nature, the arts, family, health and adventure. views of the city's famous waterways, a handsomely designed patio for relaxing and dining, fine contemporary artwork and easy access to the city's famed Water Taxi service which makes a regular stop here. Here's the view from our suite. by an international group of tourists happy for this leisurely way to get around. FORT LAUDERDALE is a city of pleasant surprises. It has invented itself through the years to become an internationally popular destination for relaxing and enjoying water life. It has also developed into a world-class shopping paradise, with fine theater, galleries and museums. And just down the road, the Everglades beckon! Variety is the spice of Fort Lauderdale's allure. We saw the "Hamilton" touring show one night, and listened to a country band the next. Cuban food for one tasty dinner and fine grilled fish at our hotel another evening. named after a lily with a fascinating history and manatees. It's fun to watch the bridges go up and down in Fort Lauderdale. Broward County boasts a series of unusual bridges. THE HOTELS and eateries are as unique and varied as are the millionaires' homes dotting the canals and waterways. No matter how often we fly in to Lauderdale to set sail, we sing the praises of this exciting yet relaxing town.Where else can you gaze at the water from the 20th floor of a top hotel and in five minutes be on the very water taxi you admired from your balcony? stars once lived. You might find your dream house. 200,000 people live here. 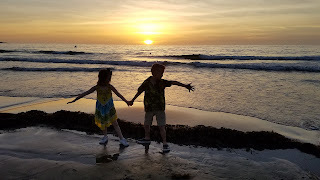 Named for a war fortification built in the 1880s, Fort Lauderdale is only a half-hour from bustling Miami, but we prefer a few calming days here in Fort Lauderdale, as we explore the Caribbean, Panama Canal and Central America. We feel "low key" here, yet with "big city" amenities. are spent on yachts and mansions yet the city remains pleasantly accessible. Because we spend a lot of time in our room -- taking photographs, reading, planning our day, writing on deadline -- we insist on a room with a view. Gallery One delivered in spades. Because of its unique structure, with many corners and angles facing the waterways, there are beautiful views from many vantage points. You can contemplate the city's history as you watch the water life below. Many stars and sports figures keep yachts here. Stephen Speilberg's was anchored near our hotel. If you're flush, you can rent it for $1 million a month. But in ages past, the simple kayak was the mode of transportation. THREE THOUSAND years ago, the Tequesta Indians fished the winding intracoastal waterways of Fort Lauderdale, enjoying the beauty of the waterlilies and living off the bounty of the agricultural land the waters nourished. They glided on kayaks past flamingos and peacocks, tangling with and harvesting the crocodile for their meals. and you can take it all in from the Water Taxi. They likely enjoyed the friendly presence of the manatee, who still gives birth in the waters that are now part of Fort Lauderdale. We saw two in the waters at the historic Bonnet House. Famous people have come and gone from the city. Dozens of movies and TV shows have been filmed here, including many of the episodes of "Miami Vice" and "The Golden Girls." Mayberry's Andy Griffith loved Fort Lauderdale and lived here many years. Lucille Ball and Desi Arnaz had a home here and liked to take their small boat out on the canals, enjoying a cocktail or two at sunset. An alligator takes a leisurely swim across the waters of the Everglades. UP NEXT: Look in front of the greenery, a bit left of center. What do you see? Might it be an alligator? Yes, it is, so climb aboard a jet boat with us and venture into the heart of the "river of grass" for an exciting Everglades airboat ride. We'll depart from Fort Lauderdale to the famous Everglades to show you some of Florida’s exotic wildlife with its miles of gorgeous wetlands. We'll get close up with an alligator while we learn about the beautiful habitat. Meanwhile, remember to explore, learn and live and catch us weekends for a fresh look at travel, nature and the arts.